Ecuador, officially the Republic of Ecuador, is a representative democratic republic in northwestern South America, bordered by Colombia to the North, Peru to the East and South, and the Pacific Ocean to the West. Ecuador also includes the Galápagos Islands in the Pacific. The capital city is Quito, while the largest city is Guayaquil. 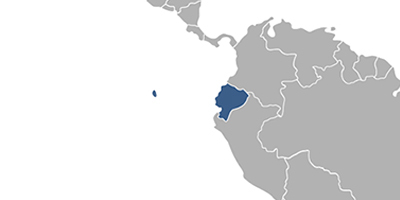 The total population in Ecuador was estimated 17.1 million people in 2018. Piso 5, Piso 8 y Piso 12. Fees associated with registration of IP rights in Ecuador are available in the fee calculator. Please contact us if the above information contains any discrepancies with Ecuadorian IP Laws.